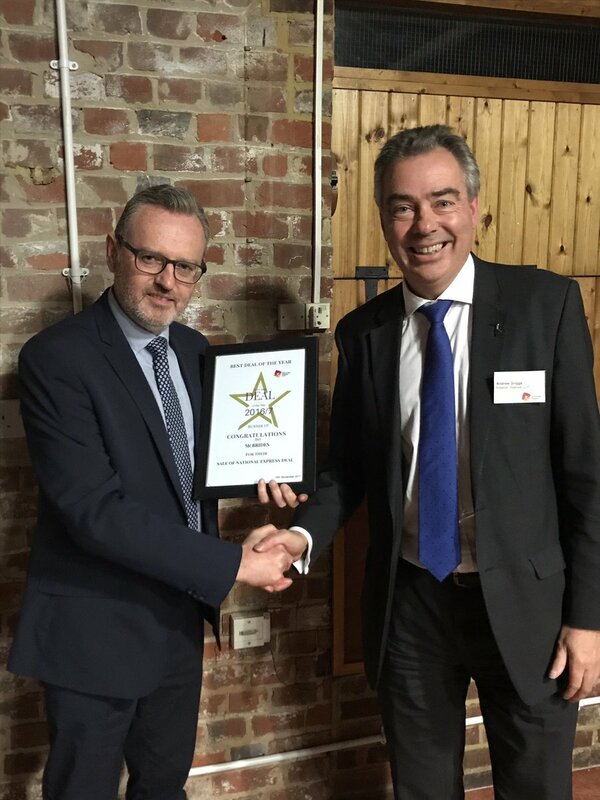 McBrides is celebrating today having been recognised in the Kent Corporate Finance Alliance (KFCA) Awards Deal of the Year for its work on the private sale of regional coach operator Clarkes of London to National Express in December last year. The McBrides team, which was led by partner Nigel Kimber and included manager Anthony Hawkins and tax partner Terry Baldwin, advised Clarkes’ managing director Debbie Newman on the sale of the 58-year old business. The deal was named runner-up in the KFCA Awards held in Faversham last night (29 November). Nigel said: “We’ve had a long-standing relationship with Clarkes having helped the business to grow over the past 20 years and saw Debbie institute a major business change programme and expansion introducing a London commuter travel service for the Medway towns and growing the business to become a 56-coach fleet operating from its Lower Sydenham base. Debbie had been working with McBrides to look at succession planning options and the disposal to a national organisation was timely and attractive to her. It also provided an excellent strategic fit for National Express, which was already operating certain services through their other Kent-based business, The Kings Ferry Limited. Acquiring Clarkes of London was an attractive proposition. Among usual sale issues, the intricate deal involved the McBrides team liaising with all the shareholders and their individual advisers and completing a company reorganisation to extract property in a tax efficient way from the trading company. To find out how McBrides could help to sell your business, please call us on 020 8309 0011.